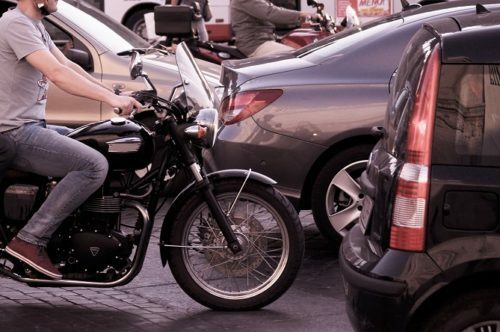 Most California drivers have had the experience of sitting in freeway traffic when a motorcycle flies past, squeezing between grid-locked cars—a practice called “lane splitting.” Opinions differ on whether lane splitting should be allowed. Some motorists—mostly those who drive cars—believe that lane splitting is too dangerous and should be banned. Motorcyclists, on the other hand, generally think that lane splitting can be done safely and ought to be legal. But what’s the law in California? Until just recently, California law was vague on the legality of motorcycle lane splitting. California Vehicle Code Section 21658—the only law on the books that would arguably cover lane splitting—says that when a roadway is divided into two or more lanes going in the same direction, all vehicles must be driven “as nearly as practical entirely within a single lane.” The California Highway Patrol (CHP) interpreted this law as neither authorizing nor prohibiting lane splitting. the flow of traffic is 30 miles per hour or faster. The prior guidelines also explained that only riders who are experienced and competent enough should attempt lane splitting. Though there’s still some uncertainly about the details of the new legislation, AB 51 makes California the first state to formally approve motorcycle lane splitting. It remains to be seen whether other states will follow California’s example.